The second in our series of new Victorian designs, this lovely transom window, will dress up any doorway in your home! The background being randomly placed clear textures surrounding the vertical and horizontal amber strips give a vintage feel to the window. Using the darker amber border for the outer edge accentuates the white roses in the 4 corners. The original piece shown here is 35" wide X 15" tall but keep in mind that this design can be customized to any size and shape you may need. Change the colors and textures to suit you style and decor too! Not only will this design make a nice transom window but it would look great as cabinet inserts or even a hanging panel. If you are looking for a stained glass piece that compliments your home decor don't hesitate in contacting us! You can send us photos of your rooms or furniture and we'll make it happen! All of our windows and panels come with metal frames. We now offer custom wood framing for an additional charge. Frames are made to the thickness and finish you request and come painted or stained to your preference. 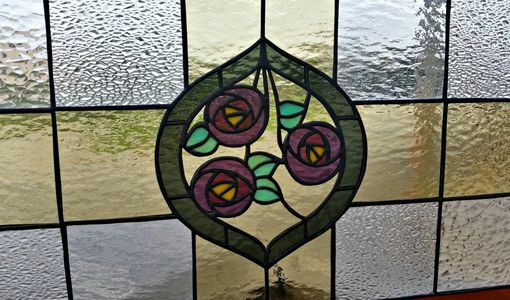 We encourage our customers to be as involved as they like in the creation of their stained glass. You can select all the glass you'd like to use in your piece. We keep our glass sample files in PDF format and are happy to send them to you. Some of our customers even like to sketch out their design and send it to us. We can work from sketches, photos, notes....to create just what you envision for your project. • Price listed is what you should expect to pay for a piece of similar size and detail in a metal frame. • This piece is already gone but we would love to work on a similar design for your home. Contact us for a quote on the size you need.